Unlacing the story of how sport became so full of money … Today, sport is big business, and Adidas and Puma are two of the biggest global brands, paying stars, clubs and competitions to wear their label, dominating everywhere from football pitches to magazine pages. This is the incredible story of how the rivalry between two brothers turned sport into an industry. 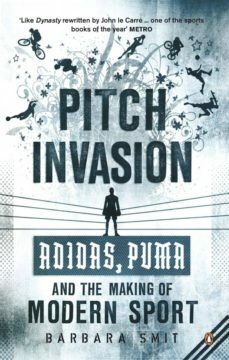 Pitch Invasion also tells the tales of some of the greatest sportsmen of all time, revealing the Pele pact, Boris Becker’s unfortunate contribution to the demise of Puma, and just how Adidas helped Mohammed Ali win his biggest fight. Reaching right up to today’s world of multibillion-dollar corporations, looking at how the arrival of Nike affected the pitch and the significance of Adidas’s recent takeover of Reebok, this is an incredible sporting drama of competition, greed, bribery, passion and shoes.